Your PC gaming weekend: win a musical RPG, big FFXIV changes, lots of PC tech news, and more! Happy June! Yes, we’re in June already, and you know that that means – E3 is only a couple weeks away. Still, that’s a couple of weeks to cram as much gaming in as possible before, all of a sudden, you’re overwhelmed with game announcements up to your eyeballs. You’ll hardly be able to concentrate on the games that you can play right now when that happens. So, while you can, let’s jump into some PC gaming this weekend, yeah? Get a break from the dungeon raiding by catching up with the latest PC games news. 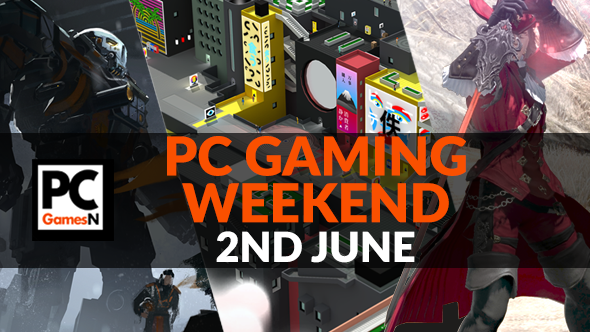 You should know what the PC gaming weekend is all about by now. It’s about playing PC games, and we’re going to tell you what you should play, so gather round, friends. We also have some news, reviews, and free games for you to win, because we’re so enormously generous. You won’t get bored this weekend and we’ll make damn sure of it. Let’s go! Win the musical action-RPG AereA – we have 50 copies up for grabs! What’s better than getting a new game? Getting a new game for free, of course. As always, we have a giveaway for you to enter right now. This time you can win one of 50 Steam keys for the brand new music-themed action-RPG AereA. You need to party up with a Cello-Knight, a Harp-Archer, and more to find the primordial instruments and restore balance to a fragmented floating island. Oh, and grab some mates to play locally for the best experience. Destiny 2, when will you arrive? Oh yeah, September, which is still a long way off. If you can’t get enough of seeing it in action, as is the case with us, then we have an insightful article for you all about its first raid. It’s very important that you know what you’re doing when you start playing Destiny 2, you see, so come along with us, increase your knowledge. If you like things that stomp as they walk then, oh boy, better strap yourself in for this. BattleTech is an upcoming mech tactics game from none other than Jordan Weisman. That’s the guy behind games such as Shadowrun and, more pertinently, MechWarrior. We had a proper chat with him all about it. It’s gonna be good, this one, we can feel it. What’s that? You want to play a new game but don’t know which one. Tokyo 42 is the one you want, people. Trust us. Played like an isometric Grand Theft Auto, it has you completing missions in the Japanese capital in the year 2042 – the idea is to clear your name of murder. But this is a game that also lets you mess around and that’s where it excels. Get into gunfights, send cats after people, jump off rooves for the hell of it. If you were once a Final Fantasy XIV player but left due to exhaustion, or for any other reason, now is a good time to come back. This month it’ll be getting its second expansion and it’s gonna be cracking. New jobs, new areas and dungeons, and battle system changes that make it a delight to play. Make sure you read up on what’s on the way. If you thought this week was quiet, think again. We were over in Taiwan attending the greatest PC tech show on the Earth. There’s loads of news to catch up on and we have a huge round-up that’ll help you do that. Here’s something to get you going: we saw something that somehow managed to make Mass Effect: Andromeda even worse. Ark: Survival Evolved is a game about, well, survival. An important part of survival is – how to put this – emptying your bowels. Having a dump. You know what we’re getting at. This week, a patch added this most important of behaviours to the game. Now you can gain experience by filling a porcelain bowl with your insides. Lovely. RuneScape should be known as the game that refuses to die. It’s been going strong for years now, and the community is making sure its fires will keep burning for a lot longer. After a public vote, it was decided that the Old School version of the game should get its hardest solo challenge ever. It has that now. You can get a cape if you beat it. At long last, that new titan is available in Titanfall 2. That means one of the best shooters in recent years has expanded and that is a very good thing. The new titan is called Monarch, it lets you upgrade its abilities mid-battle, and best of all, it’s completely free. Of course, everyone’s probably playing with it right now, but heck, it’s a heck of a machine. That’s your lot for this weekend but there is plenty more available across the PCGamesN website. Make sure to stick with us as we break more news over the weekend. And remember to check out our features, videos, and reviews so you don’t fall behind.